Anyone who has moved around the globe will understand the feeling of dislocation — faint memories of places accumulate only to diffuse the sense of belonging. Suh Do-ho, 50, has created a body of work based on this longing for and the loss of a true home. Using translucent fabric and metal frames, the installation artist recreates the houses he has resided in — his childhood home in Seoul, a studio in New York and an apartment in Berlin — down to minute detail. One can see the dials of the stove and the safety warning on the circuit box. The pink, jade and blue structures at Leeum Samsung Museum stand or hang from the ceiling and are graceful and fragile. These works at the exhibition “Do Ho Suh Home Within Home” are alter egos of the artist and testaments of his journey. Having been raised in a “hanok,” or Korean traditional house, in Seongbuk-dong, the son of painter Suh Sae-ok was dumbfounded when he moved to the United States to study. “The difference between the living spaces hit me hard,” he said at a press conference on March 20. So he started to measure things around him to materialize the causes of discomfort — the self-calming practice informed his signature pieces. “Seoul Home/ Seoul Home,” “Blueprint” and “348 West 22nd Street” are only few of the rooms he has lived in. The itinerant has moved nine times (his list includes Providence, New Haven, New York, Berlin, and most recently London.) “I choose to work with fabric because I think of one’s residence as an extension of his or her clothes; my works reflect the concept of being able to fold them up and carry them as with clothes.” He decided to use transparent material to express that the pieces are only apparitions, not replicas of the buildings. The titles of his work echo Suh’s journey. The redundant title “Seoul Home/ Seoul Home” indicate that the light green piece was on exhibition in Seoul twice. “If this work is shown in New York in the future for example, the title would change to Seoul Home/ Seoul Home/ New York Home,” explained Woo Hye-soo, the curator of the show. The tall ceiling space of the museum in Hannam-dong, Seoul is ideal to showcase Suh’s large installations like “Blueprint,” a 14-meter-long piece. “I am happy to present some works for the first time in Korea. The large space allows me to bring the more architectural productions,” said Suh. In the Black Box or a closed-off section, visitors can see smaller scale pieces, drawings and video works that follow the same theme. A doll-house piece “Fallen Star - 1/5th Scale” shows a hanok on a pink and green parachute crashing into a four-story brownstone. 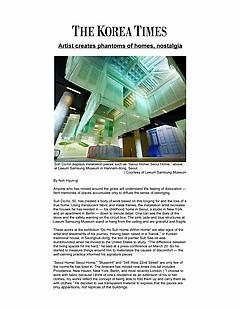 “The artist is channeling himself to his childhood home — it headed right into the new environment (New England) with the help of his memories (parachutes in the shape of hanok),” explained Woo. The miniature establishments have everything from coats hanging on the wall to leftover take-outs in the refrigerator. “It would have been wise to go with 1/6th scale, because ready-made products are available. But I choose to produce all the elements,” Suh said. An art graduate from Seoul National University and the Rhode Island School of Design, he moved to Connecticut to pursue a master’s of fine art degree at Yale University in 1997. Suh first gained international attention at a group exhibition “Greater New York” at the Museum of Modern Art P.S.1 in Queens, New York in 2000. His first solo exhibition in Korea was at the Art Sonje Center in 2003. He also represented Korea at the 2001 Venice Biennale and showcased his pieces at the Venice Architecture Biennale in 2010. The exhibition runs through June 3. The artist will give a talk on April 4 at 2 p.m. English docents are available on weekends at 2 p.m. For more information, visit www.leeum.org.